Myst: Would you recognize someone close to you if you met them in a different body? 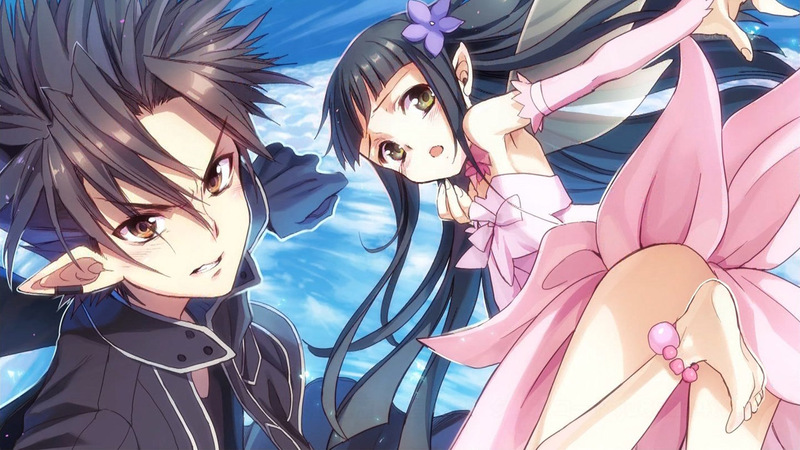 Sword Art Online’s latest arc has Kirito grouping with his sister/cousin in the new MMO by chance. Suguha has agreed to help Kirito with his quest, but the interesting aspect of this arc is that neither of them realizes that their new online friend is actually someone they know very well in real life. I’ve heard a lot of complaints that the two of them should’ve recognized each other by now, but I’m inclined to disagree. This is no longer the game Sword Art Online, where in-game avatars take the appearance of what a person looks like in real life. 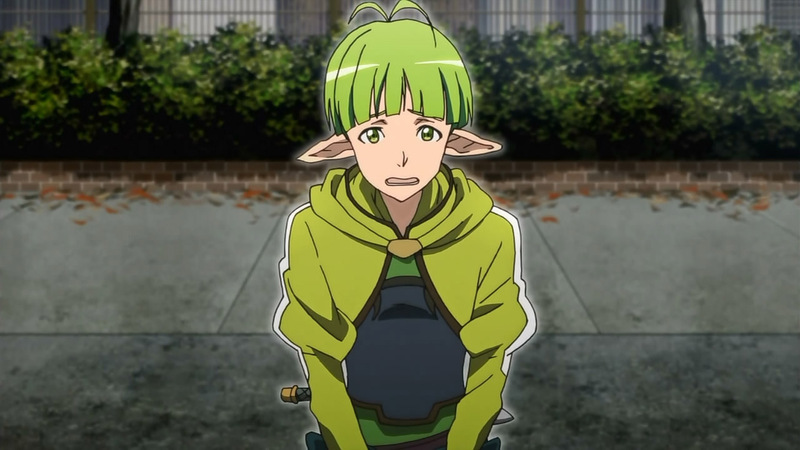 Despite Kirito’s obsession with the color black, there is little by which Suguha should be able recognize him by in his in-game avatar. As viewers we are somewhat omniscient. We see several story threads going on simultaneously and are therefore privy to more information than the characters on screen. 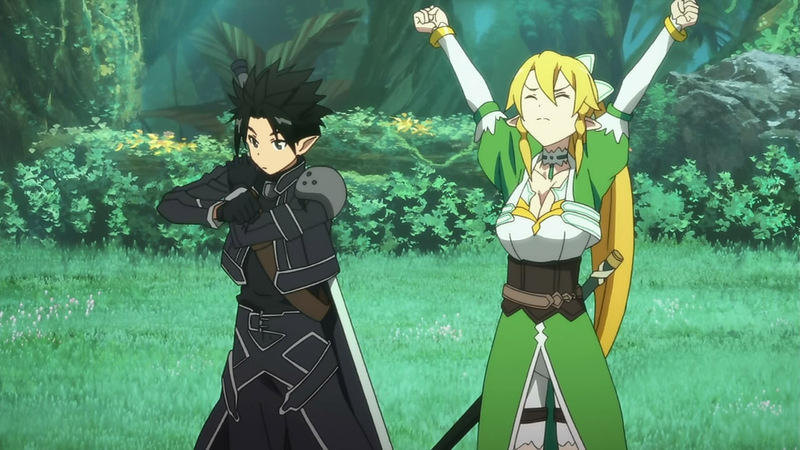 Seeing Kirito and Suguha both in the real-world and in-game allows us to make certain connections that the characters cannot. Even before Leafa was revealed as Suguha it was obvious who she was. Partially because the new OP made it so blatantly obvious, but also because of Suguha’s sudden importance in this new arc. The idea of telling the story entirely in Kirito’s perspective, and not making the identities blatantly obvious to the viewers, may be interesting and could certainly lead to a rather spectacular twist later on, but it would in no way actually work. Suguha, or Lyfa as she is called in-game, both behaves and looks differently as a fairy, this is correct. But there is one huge flaw: she sounds exactly the same as in real life. Unless they gave the character Lyfa a different voice, it would just fall flat if they went with the mysterious approach. This is also why I believe our current situation is just as bad. Why does not Kirito recognize his own sister’s voice? How can he not know that she plays Alfheim Online? I mean, it cannot be easy to hide it. If she does not respond to, say, a question, Kirito might simply walk into her room and then see her play the game. If only she had opened the door. However, right now I am only speaking from Kirito’s perspective. If we instead look through the eyes of Suguha it becomes even worse. First of all, we once again have the voice problem. Secondly, as I brought up last week, is that Kirito looks nearly identical to his real-life appearance. If anything, this should at least make Suguha question whom she plays with. To make it even less believable, we have to somehow accept that Kirito completely managed to keep his in-game name in SAO a secret all this time. Was he not a hero for saving everyone? Maybe he was not after all. But how does mister evil villain Sugou know about Kirito, then? Because he had access to the game servers? I have no clue. And let us not bring up how Kirito has a time-limit before Asuna is married off to Sugou. When Kirito went on about having a limited time to reach the World Tree, the only possible reason Suguha did not realize it was her brother she played with would be if he had not even told her about Asuna’s situation. Even if we accept that the characters are dumb, there is no way in hell they would at least not question the other player. Or, hey, notice that the other person is always in its room not answering. Did not the exact same thing happen in the last arc? Myst: You make a good point about the voices with regards to the viewer’s perception of the characters. Even if Leafa’s identity was hidden, viewers would probably be able to recognize her anyway from her voice actress. However, that is from the viewer’s perspective only. From the character’s perspective there is no reason that they should be able to recognize each other by voice because the story hasn’t given any indication that their voices would sound the same once they stepped in-game. It’s more likely that Kirito and Suguha’s voices are completely unrecognizable from their real voices because in-game it is all digitally generated. Unless, of course, the light novels actually say that their voices are the same in-game and out and in which case I will completely agree with you. At least Asuna seems to be doing something. As for Kirito’s in-game look, I think it is pretty much the same thing. We see it as almost identical, but that just points to the limitations of the show’s animation. Kirito’s in-game digital form could look different enough. I expect that one or both of them will become suspicious soon, but I disagree about immediately. With regards to Kirito’s name, I can only speculate about this, but didn’t they mention at the beginning of the ALO arc that details about the SAO incident were kept secret? As for Asuna’s situation, I don’t think Kirito has mentioned it to Suguha at all. 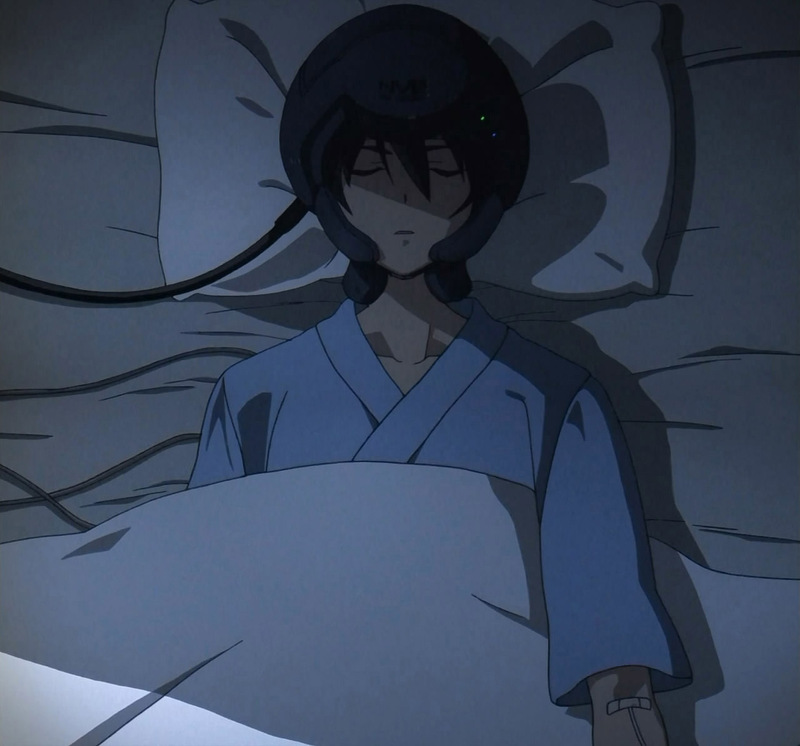 Suguha knows that Asuna is in a coma, but I highly doubt that she knows anything about her position in ALO or that Kirito has dived into ALO to rescue her. As for how the two don’t recognize something when they both live in the same house, this doesn’t bother me because not all families are that close. Marow: Now that you went deeper into the voices, it occurred to me that we have no clue the virtual reality machine, Nerve Gear, works. It does seem that the body, aside from breathing, is completely still. No muscular movement at all. This should then also apply to voices, meaning that when they speak in-game, they do not speak in real life (imagine the embarrassing lines Kirito would say in his hospital bed otherwise). In other words, the voice in-game should be… completely different. Unless there is some weird voice test before you actually start the game. Argh, we are reading too deep into this. What I can comment on, though, is that their family does seem close. I mean, Kirito and Suguha are quite friendly with each other, are they not? I cannot see why they would keep any secrets from each other. Sugou: Really? So you’re the hero Kirito-kun? 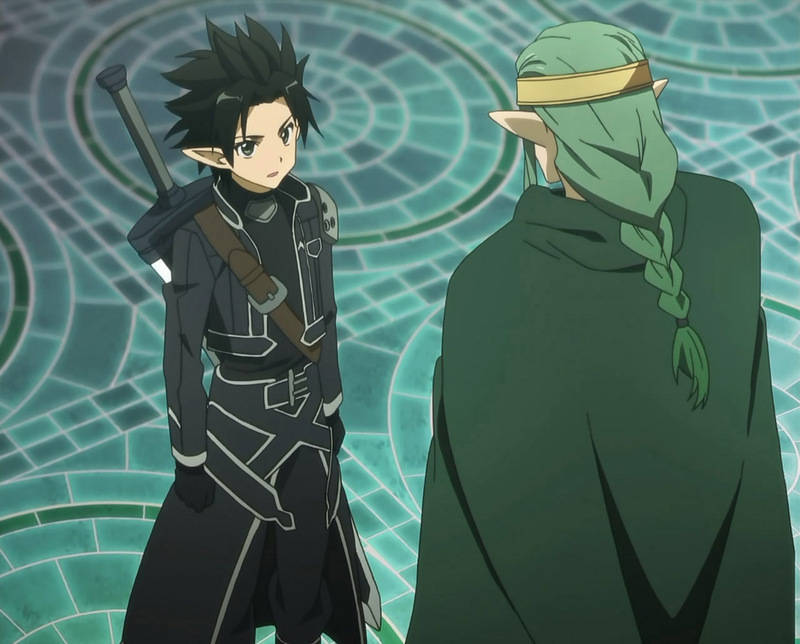 Asuna’s father: Oh, I apologize… We aren’t supposed to discuss what happened inside the SAO server, right? It is not clear whether or not they are allowed to speak of the incident, or if they only should keep quiet about it because of the players’ trauma or something along those lines. Whichever the case, the fact is that Kirito is known as a hero. In other words, he became famous for beating SAO and should be well-known to his sister Suguha. Finally, what about their parents? At least they should know what is going on and maybe spill out a comment like “Jeez, you two. Should you really be playing?”. Although… this is anime, which means parents do not exist. This entry was posted in Anime, Colloquium, Episodics, Series, Sword Art Online and tagged Adventure, Alfheim Online, Avatar, Discussion, Dumb, MMO, Perspective, Sword Art Online, Video games, Virtual Reality. Nice Site. I’ve been looking for a pure Sword Art forum for quite a while. Hope it hums for the alleged season two late this year! 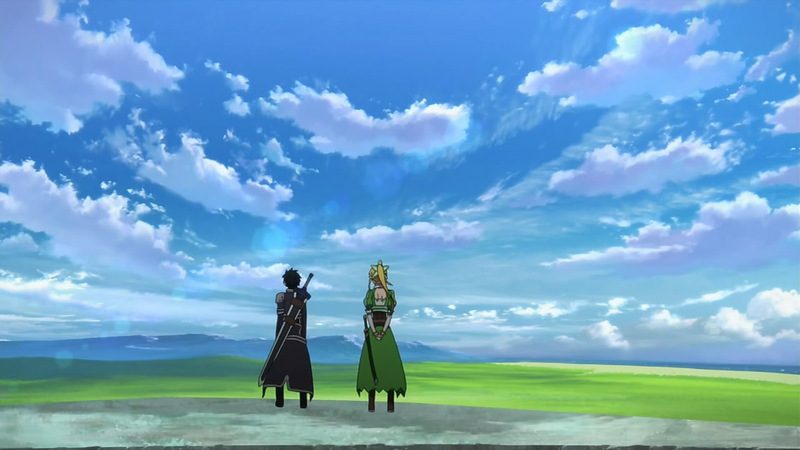 I find the prospect of a “secret” Leafa/Kirito VR romance and quiet Asuna/Leafa rivalry refreshingly intriguing and would set SAO apart from the herd. Variety is the spice of life and I think this potential taboo but sinless VR pairing will be largely responsible for carrying on interest in the show since SAO imitations are doubtlessly in the wings. Though I’ve read of fans who believe the two would’ve recognized each other off the bat, my own real-life experience finds it quite credible as there’re tons of real life examples from plastic surgery cases to insurance disguise deceptions that attest to that. At first blush it seems Asuna holds the cards in Kirito’s heart but just how secure is this? In VR they mostly pressed together to escape the gloom and depression of captivity and death and never going home again. Would’ve anything sparked between them had they first met in the real world? They might’ve been “married” in VR, but by the EE you wouldn’t known it. Maybe VR desperate ardor has cooled to mere close friendship in reality — and an opening for Suguha. Even Liz whiffs this in the EE. There seem to be hints that Asuna smells something going on between the two with how she reaches out to Leafa at 25’s close and her visuals in the teasers. Maybe a head’s-up spoiler here, but I think Suguha is sly enough to have her cake and eat it too by coaxing Kazuto to keep a platonic sibling relationship in the real world but a full-blown romance in VR. She has an incredible advantage; she knows what buttons to push and many fans say she’s lovelier and cuter than Asuna. Anyway this is a well above series with mucho potential if the producers are daring enough! If a pair of glasses is enough to make Clark Kent unrecognizable from Superman, I think we can give SAO some slack. It’s a matter of suspension of disbelief. Sailor Moon had the exact same face and voice as Usagi but nobody recognized her! I like to think that their in-game voices are computer-generated. They only sound the same as their real-life voices to us viewers. The same goes for their appearance. Real-life Kazuto is supposed to be a 3D person like us, while ALO’s Kirito is a polygonal avatar. Pretty much. For the characters it is a switch from a real-world to a digital one. But for us, the viewers, we see both worlds through the same medium. So naturally, everything looks the same to us. To me, it’s too much of a stretch. Heck, I even find Superman silly. I would forgive SAO , If it didn’t try to “take itself too seriously” at times. When it is so high stakes and there are just big flaws staring in the face , it is quite unforgivable to be honest. I do agree that we might not be able to hear the same voice , but I have been able to recognize my friends online by their “style” of speaking/chatting. Every one has some unique words or style they speak in , and it is quite common for us to point it out in someone we know. If you look back at your lives and you come across some particular phrase. You would say , “my brother/sister says that all the time”., “you sound just like my brother!”. On top of this all , Suguha has a big poster on her ceiling !! Hey , I am quite a reserved personality myself , even though I do get inside my sister’s room at times ! It just seemed too convenient for the storyline that they both don’t recognize each other. This is correct. I’m reading the light novels now and Kirito mentions their voices being different within the VRMMO game. Well, I view works of fiction as a fundamentally perverse and borderline voyeuristic (stay with me) activity in regards to observing the individual cast members. While we see these events play out, we oftentimes see them in an impossibly intimate ways, far too close for real life. While we can never exist inside the film (obviously), we’re watching the key events of their lives play out for us at all times. As outside viewers, we can see these characters giving us their pathos, their internal monologues, and their very own pasts played out for us and that’s what I feel makes storytelling so fascinating. It’s through this perceived intimacy that we are allowed to feel so close to characters who clearly do not exist. My problem with Sword Art Online’s point of view is that too many times has the show felt too awkward or too hamfisted for me to grow intimate with these characters. There’s no intimacy or closeness which allows me to grow towards the hollow shells. As for the whole real world dilemma, I’m giving it a pass for now. If Hamlet could recognize Yorick from his skull, I guess it wouldn’t be incredible if Sugu didn’t recognize Kirito at sight. 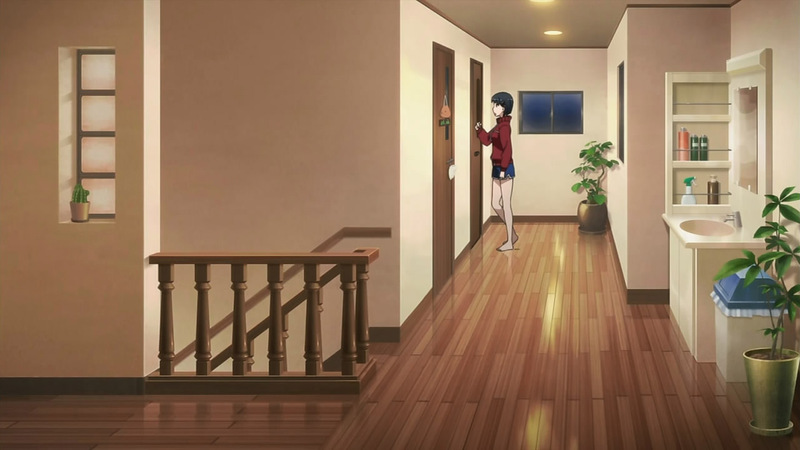 Sugu’s poster in her room is rather troubling (btw, how the hell did she even get a poster of herself?) and I’ll probably still hold it against the show in the long run, but I can probably suspend disbelief for now. Yes, you make a great point. Unlike any of the characters in the story, we, as the viewers, are privy to so much more understanding because we have such an intimate relationship with the characters. Not only do we see the characters when they are hidden from the rest of the world, but at times we also get the opportunity to listen to their thoughts. Something that no other character in the story gets to hear. But, if the characters are as awful as they are in SAO, then our close understanding of them doesn’t really change anything.They are, as you say, awkward and hamfisted which makes them unrelatable. I can’t get behind Kirito because the guy has no personality and no struggle. A nice guy who does everything right, and gets everyone to love him isn’t a compelling protagonist. And the female characters are basically all props now. 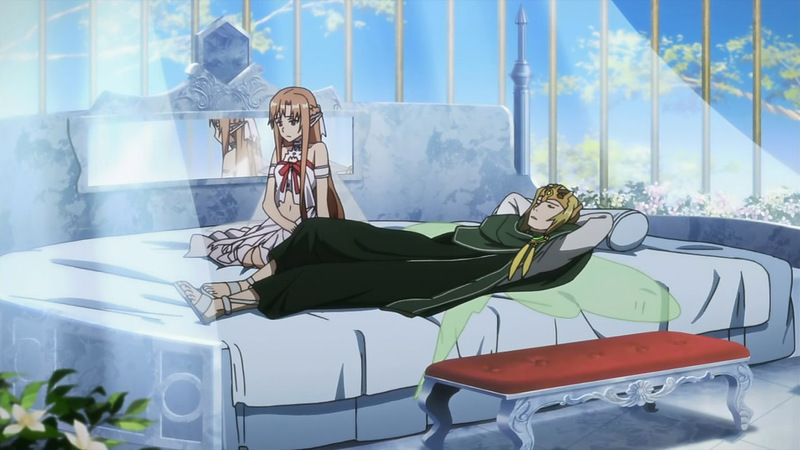 I criticized Asuna repeatedly during the first arc, but compared to the ladies in ALO, Asuna might just be preferable.